In the past, bathroom was like a business place. It was a place where you would enter does your thing and get out quickly. However, today a bathroom is a sanctuary. If your family is big and kid’s, pets and even friends kids are running up and down and demanding your attention, the last place you can hide is in the bathroom. The bathroom is the single place you can remain unmolested for hours. For you to stay in the bathroom comfortably, it has to be luxurious. 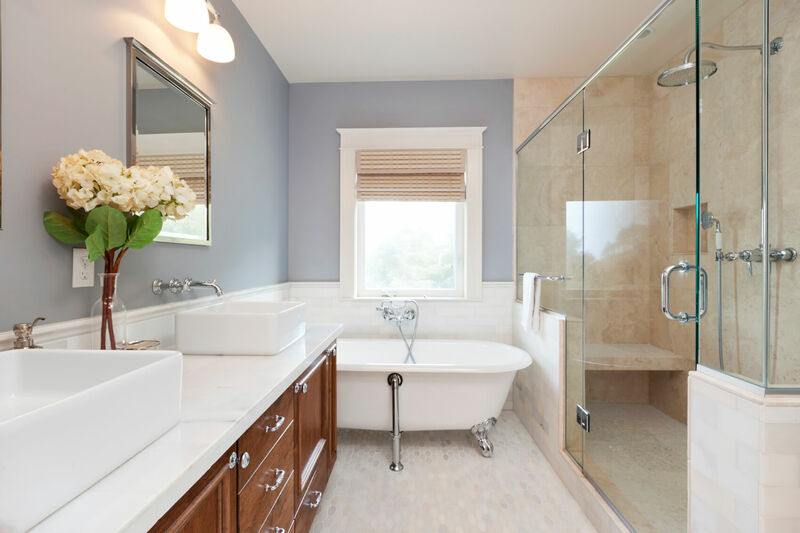 In bathroom luxurious renovation world, it includes installing jetted bathtubs, steam showers with more than one showerheads, saunas, and other high-class spa features. However, this is expensive. People in the real world cannot meet the expense of these luxuries. Fortunately, DMV Kitchen and Bath offers some tips for adding luxury to your bathroom without spending a fortune remodeling. If you wake up in the morning before anyone else has turned on the heat in the bathroom, getting out of the shower might be a chilly experience. This can be even worse if the door does not shut entirely and the pets are pushing the door in and out. However, a towel warmer is the modest way to ensure you step out of the shower and have a fantastic experience. Buying a towel warmer is a tremendous way of adding luxury to your bathroom without spending a fortune remodeling. Prices are below $100 for guileless electric models that hang on the wall. This is affordable for many homeowners. Although you may droll over the jetted bathtubs, the reality is that you spend much time in the shower than in the bath. For luxurious soak, you only get a single day for a week to enjoy the tub. In fact, others do not have even a chance to soak in the tub. Therefore, why don’t you upgrade the leaky, low-pressure showerhead instead? Also, remember that the showerhead is bathroom hardware, which is among Central areas to monitor in bathroom renovation. Therefore, it would bring much difference. Upgrading the Showerhead can cost $100. You can also get a new one at the same price. A nice showerhead does not require a fortune. If there is a collection of mismatched, shabby towels that you bought maybe last millennia. It is time to invest in a nice Powel. You have to understand that adding luxury to your bathroom without spending a fortune remodeling does not involve fixed bathroom features. Stop by a shop that sells affordable luxury and gets a new towel. Besides, getting into the bathroom with an old towel does not show any luxury. So get a new one. Are you tired of getting out of the shower and using the same towel to wipe the mirror so that you can see yourself? Well, it is time to get a Fog-Free Mirror. You should buy a small heater that is installed at the back of your mirror to absorb moisture. The heater ensures your mirror is fog-free. The heater is affordable. Besides, you cannot compare it to the luxury it will supply in your bathroom. If you have a tiny bathroom, it may not be simple to add some seat. However, Seats bring luxury to the bathroom. You should get an expert to install and position the bathroom seats in the right position. It helps you to comfort do something like remove the shoes without squatting. Besides, if it is your hiding place, it will ensure comfort. In conclusion, adding luxury to your bathroom without spending a fortune remodeling is simple and affordable. You do not have to break your bank account to transform the atmosphere of your bathroom, make it simple and live to enjoy.